Wesleyan’s Vice President for Equity and Inclusion and Title IX Officer, Antonio Farias, will leave the University on June 29, announced President Michael Roth ’78 in an all-campus email. Farias will serve as the University of Florida’s Chief Diversity Officer and Senior Advisor to the President. In his email, Roth wrote that Debbie Colucci, Equity Compliance Director and Deputy Title IX Officer, will temporarily assume Farias’ role and that the University will begin the search process for a permanent replacement in the fall. Farias was hired by Wesleyan in 2013 after having served as the Chief Diversity Officer at the U.S. Coast Guard Academy since 2005. At the Academy, he chaired the Inclusive Excellence Council and established recruitment and retention programs for students from underrepresented backgrounds. 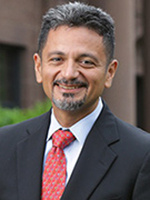 During his time at Wesleyan, Farias created a Board strategy emphasizing the centrality of equity and inclusion in collaboration with Trustees. Additionally, he furthered efforts to hire faculty and staff of color, developed training programs, and played a role in the creation of the Resource Center, which opened in September 2017. He also addressed times when he felt he failed to adequately address the needs of the Wesleyan community. “I fully own the failures along the way–and some of them were epic and necessary if you understand organizational culture change is about cycles of continuous improvement that build on lessons learned from failure,” he wrote. Looking ahead to his position at the University of Florida, Farias is planning to address similar problems of inclusion using the same community-based mentality with which he has approached his work at Wesleyan. “The University of Florida has been steadily and systematically working on how to weave questions of belonging, authenticity, and excellence into the fabric of everyday life and I have the distinct honor of joining a community of committed students, staff, faculty, alumni, and trustees ready to put in the sweat necessary to make lasting change for the benefit of the university and the great state of Florida,” he wrote. Rachele Merliss ’19, the University’s Sexual Assault Response Team (SART) intern, has worked with Farias on the Title IX Education Committee and spoke about his role in the Office of Equity and Inclusion. Looking ahead to Farias’ replacement, Merliss highlighted that whoever follows Farias should understand the importance of effective collaboration within the administration. In an email to The Argus, President Roth indicated the qualities and skills a permanent replacement should possess. Roth addressed the future of the Office for Equity and Inclusion and continuing initiatives under its new leadership.